For most people, chores are a hassle and getting your children to help out might as well be the end of the world! It doesn’t have to be that way. How can we involve our kids in chores without making it seem like a lot of work? In this article, we have some tips that can help build a household where everyone helps out so that there is time for both work and play! Children watch our every move and love to imitate us. Being a positive role model is the best way to make chores seem like part of the daily routine. Nagging at children or viewing chores as “negative” will only make it difficult for your child to get involved. If you are keeping a positive attitude toward the specific task, that will translate into your child’s attitude toward the task as well. The key to success is to start when they are very young so that it becomes part of their routine as well. Young children love to imitate their parents doing chores. 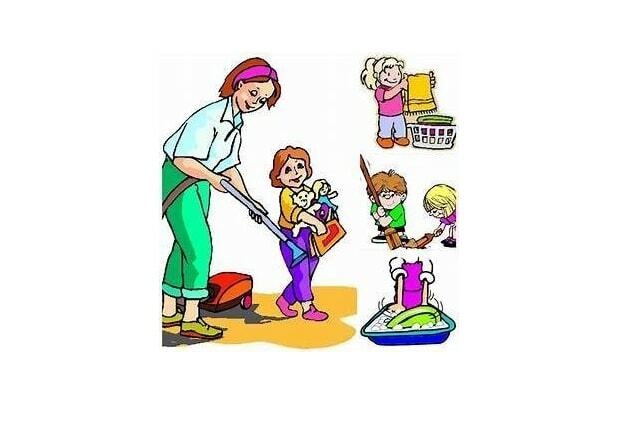 There are many chores that children can do at any age. As your child grows older, the tasks can get more difficult according to their developmental level. Motivate your children with fun activities they like to do that will come after the chores are finished. Using “first” and “then” is a great tool for children to set the expectations. For example: “First we can put all the dishes away and then we can go to the backyard and play in the sandbox.” Those two little words are a very positive way to keep children engaged and they know what to anticipate. A great way to make things simple and easy is to make a realistic schedule. Prioritize your chores and make things realistic for your child’s development. Make a cleaning routine that splits the work into small chunks so that the task is not overwhelming all at once. Doing small jobs is a lot easier than big jobs and it gives you more time to spend with your child at play. Overwhelming your child and yourself with large tasks will make everyone feel like the tasks are impossible. Keep things simple and achievable for you and your child. Using positive language to encourage your child to do something that seems hard will fill them with pride and accomplishment when the job is done. This creates a sense of accomplishment in your child that will motivate them to do their best in the future. Reward your children with affection and your time. Help your child see that with their help they will get the one thing they crave more than anything: Your attention! At Alpha’s Discovery Kids Preschool and Daycare, encouraging independence and believing children are capable of doing amazing things is something our educators put into practice every day.